Corrosion of the silo itself. Caking and agglomeration of hygroscopic material stored inside. An increase in microbial activity leading to the spoilage or contamination of the material being stored. Some chemicals can become hazardous when exposed to water. The fact that such large quantities of product are stored in silos makes the spoilage or contamination of that product a very expensive commercial loss. In the past, the traditional method of moisture prevention was the use of pressurized hot air which was blown up from the bottom of the silo. This is an effective method but the energy costs to accomplish this can far exceed the benefits. In addition, if the material being stored is powdery or the bulk density is very light, the product tends to become airborne within the silo which can lead to physical degradation of the material known as “flake off”. Another advantage in using desiccant dehumidification is that the dehumidification can be accomplished with a small, energy efficient dehumidifier. Therefore, there are no problems with bulky equipment and high energy bills. 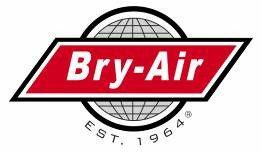 Depending on the customer’s preference, the Bry-Air, Inc. unit can be placed next to the silo or mounted on a catwalk. If desired, multiple silos can be fed from a single dryer in a central drying arrangement or smaller “dedicated” units can be utilized on each individual silo. 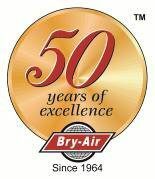 The Bry-Air, Inc. desiccant dehumidifier is designed to provide dry air continuously and without the high temperatures that could cause damage to the product. Regardless of ambient conditions, the Bry-Air, Inc. dehumidifier provides dry air inside the silo that is below the dew point of the air outside the silo, thereby eliminating any condensation and the problems associated with condensation. The dehumidifier should be sized to deliver 100% fresh air in an amount equal to at least one air change per hour based on an empty silo. The total volume of the silo divided by 60 indicates the minimum CFM. For low dew point applications, when hygroscopic products could be subject to significant moisture regain, or when interior to exterior temperature differences are more extreme, it is preferable that the fresh air be pre-cooled before dehumidification (chilled water or DX). If the dehumidification system is designed to re-circulate the silo air, additional filtration may become necessary. Care should be taken to prevent product dust from entering the dehumidifier from back pressure when filling the silo or when returning product back to the silo.